The homepage designed for the 13th International Congress on Flavins and Flavoproteins was one of my most successful projects. 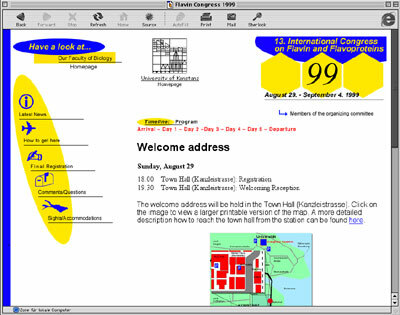 The web site was an integral part of the organization of this scientiic event. Preleminary registration was done using the web site. Latest information about the meeting including the program schedule, information about how to submit a poster and where to find accomodation and how to get to the conference location was porvided on the homepage. The homepage was updated frequently and was of great help for organizers as well as participants.